Looking for funding for your business? 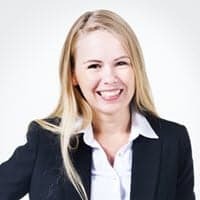 If you don’t have the time or the credit for a loan from a bank to be a viable option, you may want to consider Kabbage or OnDeck, two online lenders. Both lenders offer a much faster application process than you’d find at a bank, with little paperwork involved. Approval rates are high and you get your money fast. Since Kabbage doesn’t have any credit score requirements, it works well for those who don’t have the best credit. The annual revenue requirements are also on the low side, making this lender a good choice for small businesses. Kabbage’s online application process doesn’t require any financial records and typically takes under 10 minutes. After applying, Kabbage lets you know whether you’ve been approved or denied immediately. You may be able to get your money immediately if Kabbage is able to check your business and banking information quickly enough. This lender offers a debit card, instant transfers to PayPal, and direct deposits to your bank account, with the first two options being the fastest. 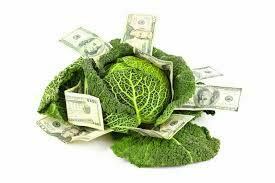 When you get a line of credit through Kabbage, anything you borrow you pay off in either 6 or 12 months. The interest structure in Kabbage is front-loaded. If you have a 6-month term, then you pay a higher interest rate for the first two months, and 1-percent interest for the next 4 months. If you have a 12-month term, you pay that higher interest the first 6 months and 1-percent interest for the final 6 months. You can pay it off early to lower your fees, although you won’t save much the majority of the time due to the front-loaded interest. Kabbage is more expensive in terms of interest than OnDeck, so the lower minimum requirements come at a cost in that regard. It is very convenient, and it’s most useful for businesses that need additional money on hand for day-to-day operating expenses. The application process for OnDeck is more in-depth than it is with Kabbage. You must personally guarantee loans through OnDeck, and the lender may put a lien on your business’s assets in the event you default on your loan. OnDeck won’t put a lien on your business’s assets for its lines of credit, but those still require a personal guarantee. OnDeck does have a list of restricted industries where it won’t lend money, so make sure your business isn’t on there. 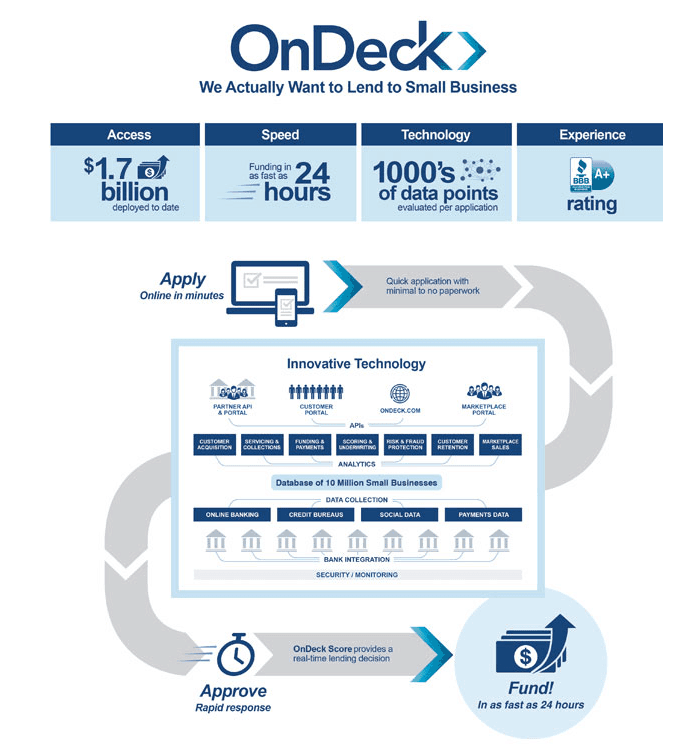 OnDeck’s application is still fairly quick, taking most borrowers around 10 minutes. The lender makes their decision within a few minutes of the application’s submission, and you can get your money within a day, although it usually takes a couple days. While OnDeck has lower APRs than Kabbage, keep in mind that your first loan through OnDeck have a 2.5-percent origination fee, and your second has a 1.25-percent fee. After that, you won’t have any fees on subsequent loans. You can repay your loan early to pay less interest, and the standard repayment schedule is either daily or weekly through automatic withdrawals from your business’s bank account. With lines of credit, every time you borrow from one, you pay that back over 6 months. The lines of credit available through OnDeck are a good choice for handling day-to-day expenses, just like the lines of credit available through Kabbage. The payment schedule is convenient and you can take out money when you need it. Loans through OnDeck are best for situations when you need a large lump sum of money, such as when you’re going to expand your business. The daily or weekly repayment schedule means you’ll need to manage your business’s bank account well. Kabbage and OnDeck are both good online lenders, the key is finding the one that best fits your needs. If neither seems right for you, there are plenty of other online lenders out there to check out.